What’s The Best Way to Get into Your Customers’ House? 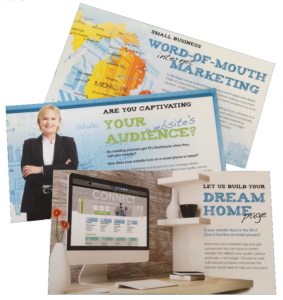 Direct mail campaign pieces are the key to get into your prospects home AND hang out a while! A recent Royal Mail Market Research “The Private Life of Mail” study researched how mail is filtered, handled, discussed, shared and filed at home. 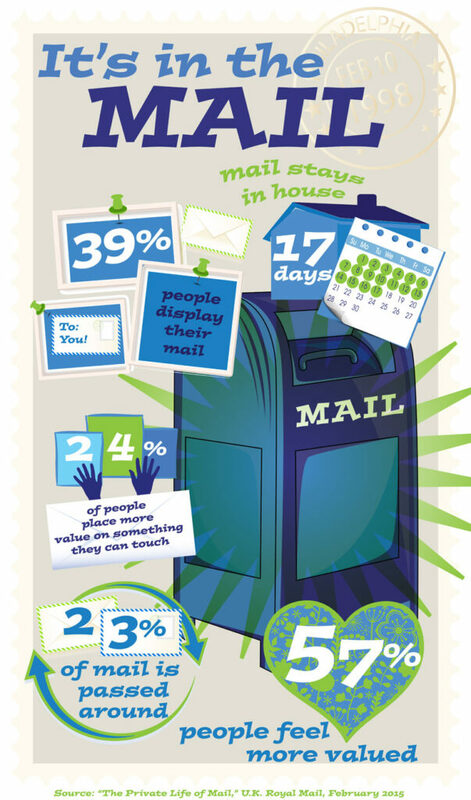 By following how mail interacts in the home revealed beneficial insights for brands. For instance the study discovered an average piece from advertising mail or a direct mail campaign stays in the home 17 days! I dare you to get a Facebook ad to be so consistent! People place 24% more value on something they can touch. 57% say it makes them feel more valued. Nearly 40% of homes display mail. Of course people display the mail they receive that is attractive, informative and if it stands out from the pack. Studies show if the design and message of a direct mail campaign lands flat the chances of winning shelf space are pretty low. Direct mail campaigns are perfect opportunities to increase brand awareness and keep you at the top of your customers mind. Wouldn’t it be great to know your recent postcard mailing was deemed refrigerator worthy? Be sure to show your brand in it’s brightest light. When planning your next mailing be sure to budget time and costs for custom graphic design and professional print. Yes desktop publishing apps allow you to create your own postcards or print brochures and you can even print them on the inkjet printer you have next to your desk. Be honest with yourself.. If the piece your just created came across your desk, what would you think of the company that sent it to you? Does professional or cheap come to mind? Direct mail campaigns are typically made up of postcards, brochures, catalogs, etc. However, direct mail is not the only entry into your customers homes. Think about other print pieces customers or prospects may hold onto. These ideas could range from one affordable postcard with an appointment reminder, an attractive brochure with a unique fold or special paper stock. Think about what you might hold on to. How about thank you cards, greeting cards, coupons? The longer the piece stays in the home. the more often your name is in front of people who enter the household depending on where the mail is displayed. E-mail marketing, social media. and mobile advertising can drive powerful results. However, as this study shows people still appreciate the tactile and personalized nature of mail. The next time you are planning to reach out to your customer, remember a combined marketing campaign always offers the best results – and mail is a highly cost effective component to include in any combined marketing campaign. Now what are you waiting for? Call us today for a consultation. Take advantage of our August special for 25% off graphic design services. Through August 31 graphic design services also include logo designs, infographic creation, brochures, digital graphics and more. These custom graphic design marketing items can be reused time and time again. 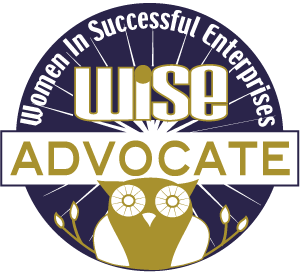 Do you have an upcoming event, new product or service? Are you or your staff attending trade shows, marketing events or sales meetings? There are many types of brochures to select from to communicate your message. A custom designed and printed brochure can offer flexibility and credibility for; face to face meetings, follow ups from phone inquiries, and website visits. Print items serve as reminders to prospects and customers and work to build brand awareness. Print communicates clearly by including brand visuals, contact information, specifications of products or services, diagrams, photos, dates, maps, and forms to be returned, and more. For a brochure to be effective it needs to be designed well and incorporate consistent use of your brand elements. Eye catching graphics, clever messaging and subjects of interest to the audience, will entice prospects to pick it up. When designing a brochure it is important to align it with your brand promise and in a form and style that relates to your target audience. This brochure type serves as an initial introduction to prospects. What information can paint a clear picture and allow people to contact you easily? Contains information company representatives can use as a sales tool. Don’t assume sales staff memorizes all the key messages for each product or service they pitch during a presentation. Include important information in a sales support brochure to make sure everything is covered accurately. The brochure or sales tool will be left behind for prospects to review after the account representative is long gone. What product information is most important to prospects? Create a brochure to promote your event and another brochure to distribute during the event for attendees to reference, (consider accommodations, maps, schedules, etc.). Remember to include dates, times, locations, contact information. Ever seen a brochure or event advertisement that didn’t include the location? Or the start time? Unfortunately it happens too often. (You may want reference a print checklist when creating your print material.) With all types of brochures there are elements that should always be included. It is easy to forget even obvious content when you are too close to the project. What information do you need to include in each brochure? Of the many types of brochures direct mail brochures are the most popular request by our customers. According to Direct Marketing Association direct mail boasts a 4.4 response rate. Does 4.4% seem low to you? Compare it to the average 0.12% for email campaigns and you may change your mind! These statistics on average direct mail response rates is from 2012 when print was at an all time low. Yet it was still beating digital response rates. Now that print is gaining in popularity again the number may be higher. Who do you want to reach? What product or service or special offer will you feature? What database/mailing list will you use? Do you need to purchase a list? What size will it be? Self-mailer or envelopes? Have you considered postage and handling fees into your budget? Prospects pick up these brochures to read later. Companies place them at check outs, in point of purchase displays, statement stuffers, as product inserts, they may include product instructions, warranties, etc. Can you promote additional products/services as part of a sale? Can you introduce a new product or service to a clientele who are already engaged with your product or service? Could you increase the value of your product by suggesting multiple uses of products or services? Share new policies, promotions, etc. Whichever types of brochures you decide your company needs, get clear and concise. Don’t skimp on the attraction quotient! Communicate your message, market your brand, and make a good impression by paying attention to the details. If you need help determining the best print solutions for your budget give us a call or complete the inquiry form here. If you think print marketing is a good option for your company don’t hesitate to connect with us! For the remainder of this month postcard design and printing is 25% off. Respond by July 30, 2015 and save. In the age of digital apps, conscious budgeting and google images, small businesses are creating print marketing materials in-house. This isn’t always easy to do, but it can get simpler. Follow this professional printing checklist to prepare a digital file for offset or digital printing. Check the fold. Are copy and images formatted in the panels as intended? Whenever possible it is helpful to receive a physical proof of the document from your print vendor. If an in-person proof is not possible a digital proof from the print vendor helps verify the file transferred as designed. Talk to you printer if you need help preparing a document. Graphic designers and printers can make adjustments to your layout if you request these services. Layout and design services are based on an hourly service fee. After the initial proof, industry standard is time-based billing for additional editing and proof services. If all of this sounds greek to you Connection Group and other graphic designs firms can print and design sales sheets, brochures and postcards for you. When hiring a professional design firm expect expertise in design and print. Along with the above professional printing checklist, there is a couple of extra steps of file preparation for graphic designers who are preparing files for publishing. You already know to choose quality fonts and consider graphical effects, color theory and the type of digital art, vector vs raster, which software is the best to use for page layout, etc. If you are using Adobe InDesign for preparing page layout files for professional printing projects always package the folder prior to sending the final file to the printer. Choosing package under the file menu in InDesign will create a complete folder for your final document. There will be a copy of all the files, fonts, graphics and photos used in the document nested in this folder. This helps for future retrieval when the document is re-ordered and requires changes. The other benefit of packaging a file is that InDesign runs a test for pre-press of the entire file. This pre-press test looks for missing fonts, missing graphics and photos, use of RGB or other color models in graphics and photos within the document. This pre-test allows you to go in and make edits to the print file elements prior to sending it to the printer vendor. The more work you can do to create a trouble free file, the lower the printer fees, time delays and the higher quality end product. Remember to add crop marks, printers marks, trim marks and bleed on your final pdf before sending it off to your printer too. Good luck with your print project, call us if we can help. Connection Group is located in mid-Michigan. We love to work face to face with our clients in Lansing, Grand Rapids, Kalamazoo and everywhere in Michigan in between. Our digital design and online print service ordering area serve St. Petersburg, Florida to Vancouver, Canada from south to north and New York, New York to Big Bear California east to west. National on-time service paired with genuine small business attention. 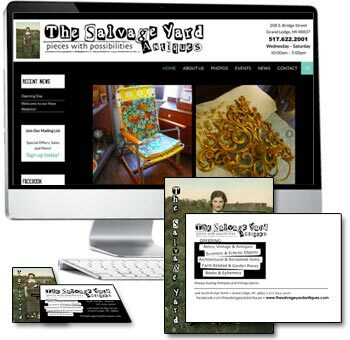 A long time customer, The Salvage Yard Antiques in Grand Ledge, Michigan is expanding and has contracted Connection Group for web and print brand design. Brand Print Items: Updated business cards and new postcards incorporate the same brand images. Keeping colors and visuals consistent help build a recognizable visual brand – plus saves money on design fees! Connection Group printed a larger quantity of postcards than needed to promote the upcoming open house. Keeping the information generic without dates adds the flexibility to be used throughout the year for multiple purposes: future promotions, new product announcements, thank you notes, and more! Congratulations to The Salvage Yard Antiques on your expansion! For those in the Lansing and Mid-Michigan area be sure to stop in for the opening. For those out of state this is a destination shop not to be missed when you are in Michigan!